Filed to: project dammit David what did you buy this time?Filed to: project dammit David what did you buy this time? 1950 Buick Super Coupe. 263 Fireball I8, 2 speed DynaFlow Torque Converter Emporium, and a fairly straight body for a mere $500. 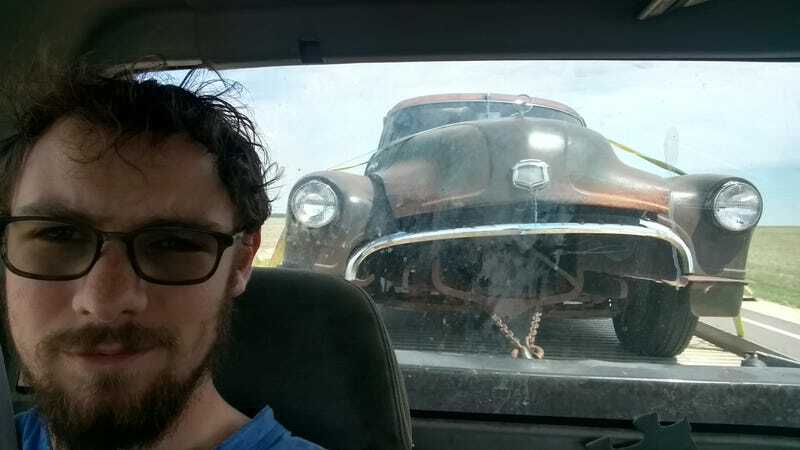 My friend and local fellow Buick aficionado jumped and we picked it up this morning. This cars tags are dated 1969 so it’s been off the road for nearly 50 years but obviously someone gave it some love (or started to). Look at this rubber! Looks like it’s been punched in the mouth tho. “Body by Fisher” reminding us that these are coachbuilt vehicles. This was, at one point, a wiring harness. Oh! Well. That’s why it doesn’t run! Fuel filter is busted. Some of these panels even have paint! No real plan yet. Two gallons of water came out of the engine so just for giggles we (he) is gonna try to un-seize it and see if it’ll fire. Most likely getting a new wiring harness, 12v conversion, interior stripped out and seats restuffed/covered, needs a new floor pan, 5.3 truck motor. Not sure if we’ll keep the patina’d paint and just polish it up a little or paint it flat black and go full hot rod. He has a thing for flat black paint. I don’t get it. Anyways, I’ll keep you all updated on this thing. It’s shockingly straight and complete for what it is. Front floor pan and some minor sill rust, all the glass is there, a few minor-ish dents here and there (the worst is on the fender in the pic above). Suspension seems very solid, frame is like a rock, doors open and shut with authority. Hell of a bargain.